Caroline Lucas is simply the most significant individual that the Green Party (England and Wales variety) has ever had and yet many in the party are having difficulty with her belief that a ‘Progressive Alliance’ (PA) is either possible or desirable at this time of momentous political upheaval. Of course Lucas may well stress this is exactly the time when we need one. In order to have a PA you need a certain amount of consensus between parties and even among Green Party members. Does it exist? Can it be forged? Perhaps, it’s all in the title ‘PA’? Had it been called ‘The Alliance to get rid of the Tories’, it may have had more traction with people. It is quite clearly bunk to have a ‘progressive’ alliance with a party, the Lib Dems, who have just spent the first half of this decade in bed with the Tories; shafting the nation (they are yet to have their ‘Corbyn’ moment). The reality, though, isn’t whether the Lib Dems, the SNP or Plaid Cymru are on board with the PA; the crucial party is and always has been the Labour Party. All else is pointless unless the Labour Party is onside with a PA.
Of course, the Labour Party isn’t even onside with itself, let alone any other party. There is total melt down in relations between the more right-wing (the Blair/Brown side; the side that has most of the MPs and councillors in the party) and the left-wing Corbyn side (now comprising the vast bulk of the ordinary members). Corbyn isn’t beyond political games and he has to play a ‘smart’ game within the Labour party, especially in Parliament. Three votes at the end of the last session of Parliament showed how Corbyn is prepared to operate and it generally wasn’t in favour of supporting PAs. The one on renewal of the Trident programme Greens applauded, because unlike the vast majority of Labour MPs, Corbyn voted against renewal. As a long time supporter of CND Corbyn could not be seen to play politics with the issue or else his entire ‘lefty’ credibility would have been blown out of the water, so he had to accept that the vast majority of Labour MPs would vote for renewal. On two other bills he did play politics. One was the NHS Reinstatement Bill, to make the NHS fully public and drive out the private profit motive from the health service (something Andy Burnham and the last Labour government opened the NHS up to), the other bill on introducing Proportional Representation (PR) and votes for 16 year olds. Labour MPs were asked to abstain on the bills! 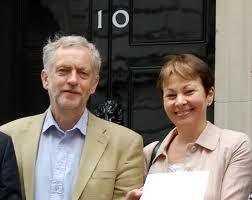 Caroline Lucas was the lead MP on both bills. Now Corbyn is not an advocate of PR, his mouthing on the issue is best described as lukewarm and he knew he couldn’t, even if he wanted to, persuade Labour MPs to vote for a system of PR, so an abstention vote saved Labour from being seen (we Greens and many others saw it though) as against opening up a wider and more democratic voting system within the UK. The choice of Labour and Corbyn to abstain on the NHS Reinstatement Bill beggars belief, but yet Corbyn did knowing he couldn’t get his MPs to back the bill. Although during the recent Labour leadership campaign he called for the renationalisation of the NHS. This is a man in agreement on the issue with his members at large, but not in control of his MPs in Parliament. The differences between Labour in Parliament and much of the party at large are irreconcilable and the party will split. In such circumstances a PA to get rid of the Tories is doomed to failure. Perhaps the only thing either side of Labour will learn from the debacle is that to get rid of the Tories, for most of the time, we need to introduce PR (PR doesn’t guarantee it, no more than it guarantees a Green government; PR is just more democratic and should be supported by people who believe in extending democracy). Eventually, the Tories, as all governments do, they will lose office more because of their own short comings than the positives of the opposition. When that occurs, most likely to another coalition government of sorts, will all the other parties stand-up and call for PR? Corbyn will win the new election for the Labour leadership (just as Lucas/Bartley will win in the GP leadership contest) but his problems will start all over again. The vast majority of Labour MPs simply take no notice of him. Forming part of a PA is the last thing on Corbyn’s mind; he cannot even form an alliance with his own MPs. The scenario is this, Labour simply splits, details unknown at this time, but the outcome (unless a snap – we’re obviously running out of ‘snap’ now - general election is called) is a 2020 General Election where two versions of Labour are competing with each other, and what is on their mind isn’t a PA with each other, let alone anyone else, but the destruction of the other ‘Labour’ party is. To say this is all rather messy is an understatement and the mess is likely to lead, barring other political meltdowns, to 400+ Tory MPs in Parliament. Unfortunately the reconfiguration of the British ‘left’ is going to be slow and torturous. In the meantime the Greens have to decide do we continue to push for a PA that is unlikely to have any significant impact given present circumstances, or are we going to have to knuckle down and present out own unique selling points to the electorate. That might be best done by focusing on civil disobedience actions, such as anti-fracking, anti-nuclear ones etc and supporting workers in struggle against the Tories and ruthless employers.